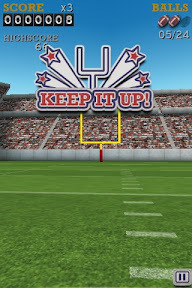 The SuperBowl day a lot of App Store games went free, among them a little gem of casual game playing. 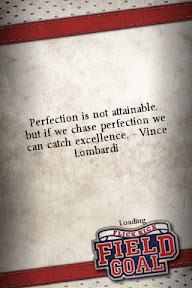 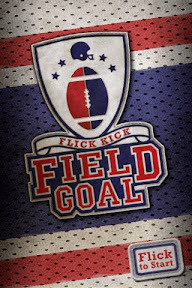 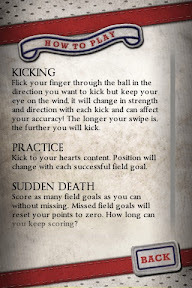 In Field Goal (iTunes Store link) your objective is simple. 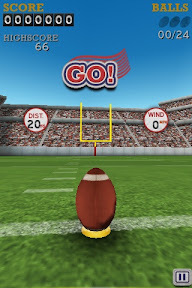 Flick your finger against the ball to score, well, a field goal. 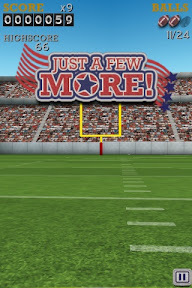 Great 3D setting, the only problem I've run into so far (not counting playing too much it) is a small glitch when your ball enters very close to the poles and it registers, oddly enough as miss. 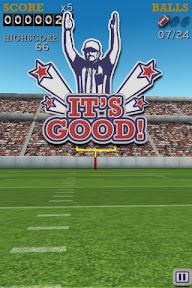 Odd, because there is collision detection against the poles! 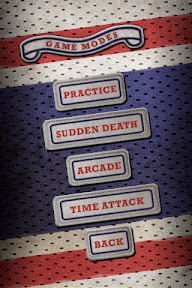 OpenFeint enabled to keep track of how well you do it against your OpenFeint enabled friends (and with a lot of trophies, like "hit the pole and score"), and 3 game modes (beside practice mode) to keep you entertained for a long while, as will the amusing loading screen quotes and retro-inspired banners (above). 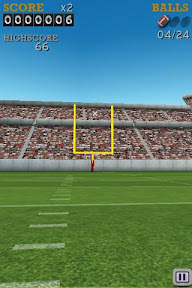 For 0.79€ it is really worth the price, as you will be playing it more often than most other expensive games.